When Jon and I got married 4 1/2 years ago, we each brought with us a queen-sized bed. Jon’s mattress was the newer of the two, as well as a pillow-top variety. It felt so soft and cushiony, sort of like sleeping on a cloud. I loved that bed, or at least I thought I did. Perhaps I loved it so much because of the bed I brought with me into our marriage. My mattress set was old, and I never liked it from the start. It was a cheap mattress, much firmer and harder than I liked. But it was free. My parents had given it to me when I went through the divorce. I was grateful for it, and while I occasionally dreamt of buying something softer, I slept on it for three years. Once, I bought myself a cushiony mattress topper, which helped quite a bit, especially as I didn’t have the money to buy a brand-new mattress set. 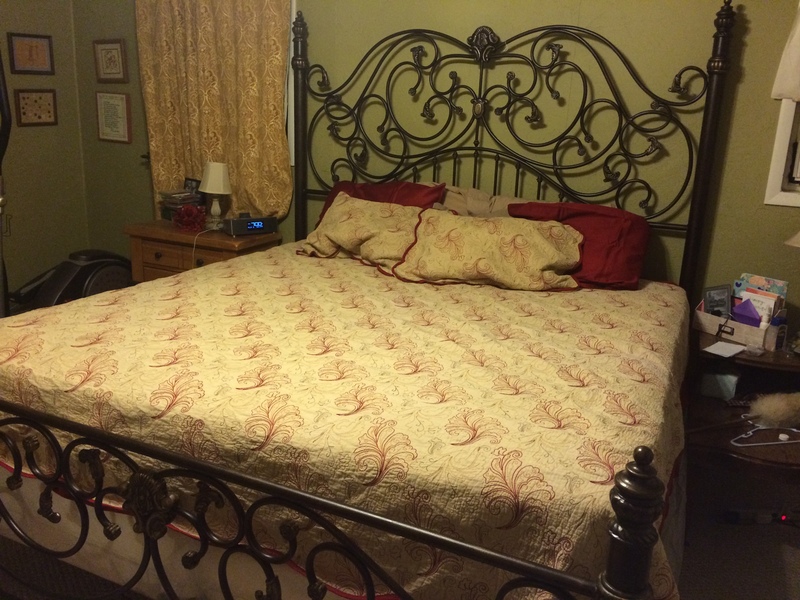 However, I had one thing Jon didn’t have … a headboard and footboard. I loved my country-style bed stand, having picked it out as a gift to myself. I had several other matching pieces that went along with my bed, including a mirror-topped dresser and a bedside table. Oh, how I loved that everything matched. Even if I didn’t love the mattress, I adored the look of my bedroom with it’s coordinated furniture. It didn’t take long for us to both agree that his mattress was the one we would use, adding my headboard and footboard to it to give our bedroom a brand-new look. It felt like the perfect compromise. However a week later, Jon and I decided we had made a grievous error in judgement. You see, Jon’s mattress may have been newer and softer, but it also had a rather large “dent” in the mattress. At night, we found that had to cling to the sides of the mattress all night long in order to not find ourselves stuffed like sardines in the middle of the sagging bed. Fighting for much-needed personal space is not a good way to start a marriage. “Why didn’t you ever turn or flip your mattress, Jon?” I asked him, probably with too much of a whiny tone in my voice. Soon enough, we were sleeping on my old, hard mattress. As it turned out, Jon loved it. He claimed his back aches all but disappeared, a problem that had plagued him throughout his adulthood. But I hated it. I had tasted what could have been. Now, going back felt painful. Oh, how I longed for a softer bed! A couple of months ago, my much-loved bed frame broke. Jon tried, but it couldn’t be repaired. We needed a new bed frame for our mattress. So on the next Saturday morning, Jon and I went shopping … for bed frames. As much as I hoped, it was not part of our plan to buy a new mattress. Yet shopping for beds is a lot like shopping for cars. When you find a deal on the car you want, you better pounce … it might not be there the next time you go car shopping. That’s sort of what happened on that Saturday morning. As soon as Jon and I walked into the store, I had a feeling there were deals to be had. We had shopped this same store several months earlier when we had purchased new beds for our boys. At that time, the store had been stocked, wall-to-wall. But now, the inventory was low. One of two things was happening: this store was going out of business or they were reducing inventory before paying taxes. Either way, I knew we could get a bargain. And we did! Jon and I got a sweet deal on a top-quality king-sized mattress set, a headboard and footboard, as well as free delivery and no taxes. It was a bargain we couldn’t pass up, and fortunately we could afford it. Our new bed is amazing … soft enough to please me and yet firm enough so as not to cause Jon backaches. Even though the bed frame no longer exactly matches the mirror-topped dresser, it doesn’t completely clash either. So many reasons to love this big new bed! Last night, as I crawled into bed, I realized none of those reasons I listed are my favorite part about my new king-sized bed. With Jon out-of-town on an overnight business trip, I crawled up into that big comfy bed all by myself, and felt the impact of the emptiness. What an incredibly lonely feeling! I wasn’t scared, and yet how very hard it was to fall asleep. Even with the dog cuddled up beside me, I felt tiny in our huge bed, swallowed up by the expanse of the space. In that moment, I was reminded that the best thing about our new bed was the same thing I loved about the old, hard mattress. It’s the person I share it with every single night. It’s been a little over four years since I took vows to love Jon in sickness and in health, in good times and bad time, for richer or poorer … and perhaps I should have added “whether we sleep on saggy mattresses or luxurious beds” to my promise. I really do love that man, no matter what sort of bed we share. But please, please, Lord Jesus… don’t test me on this one! LOL … taco bed! I love it!